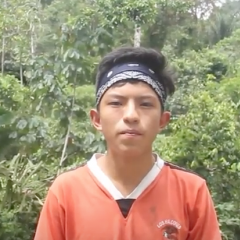 Daniel Benalcázar is a member of the Kichwa Peoples of Sarayaku located in Amazonian Region of Ecuador, and which has held long fights at a national and international level to stop extraction projects in their territory. The following is a transcript of the video of Daniel's comment about the word cloud for the term “Sarayaku“. Yo escogí esta nube de palabras de la palabra “Sarayaku” porque es un pueblo guerrero que está conformado por ancianos, adultos, jóvenes niñas y niños. Además, por ríos, árboles y espíritus que también lo conforman. Yo quiero que en esta nube de palabras aparezca cómo los jóvenes participaron en esta lucha histórica de Sarayaku. Además, también quiero que aparezca la palabra “educación” porque en Sarayaku no tenemos una educación de calidad como en las ciudades. I chose this word cloud of the word “Sarayaku” because it is a warrior community, which is composed of elders, adults, youth, girls and boys, as well as rivers, trees and sprits. I would like this word cloud to show the youth’s participation in Sarayaku's historic struggle. I would also like it to include the word “education” because in Sarayaku we don’t have a quality education, such as the one from the cities. Belén Febres-Cordero assisted with the proofreading and translation of the post, which was edited for clarity and length.